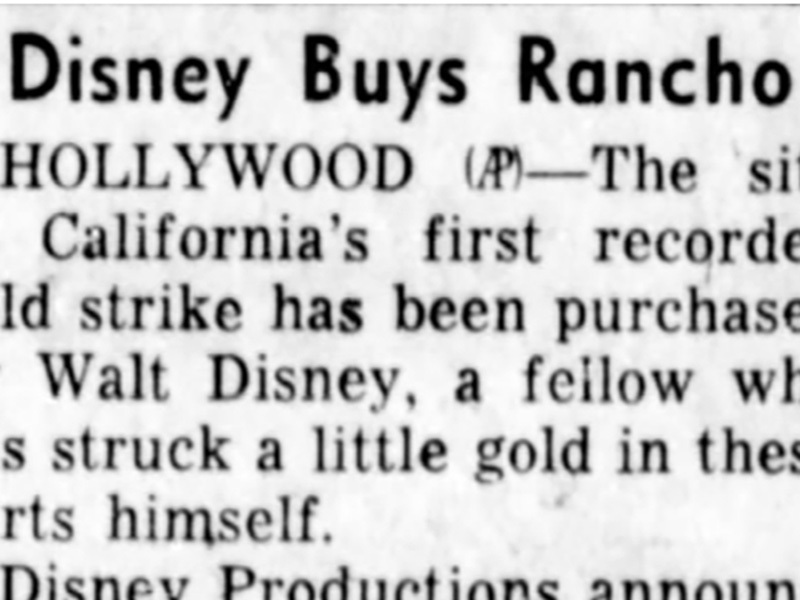 SCVHistory.com | Film-Arts | Walt Disney Purchases Golden Oak Ranch in Placerita Canyon, 4-8-1959. Walt Disney Purchases Golden Oak Ranch in Placerita Canyon. Announced: April 8, 1959 | News Reports. The Associated Press, as published in the (San Rafael) Daily Independent Journal | April 9, 1959. HOLLYWOOD (AP) — The site of California's first recorded gold strike has been purchased by Walt Disney, a fellow who has struck a little gold in these parts himself. 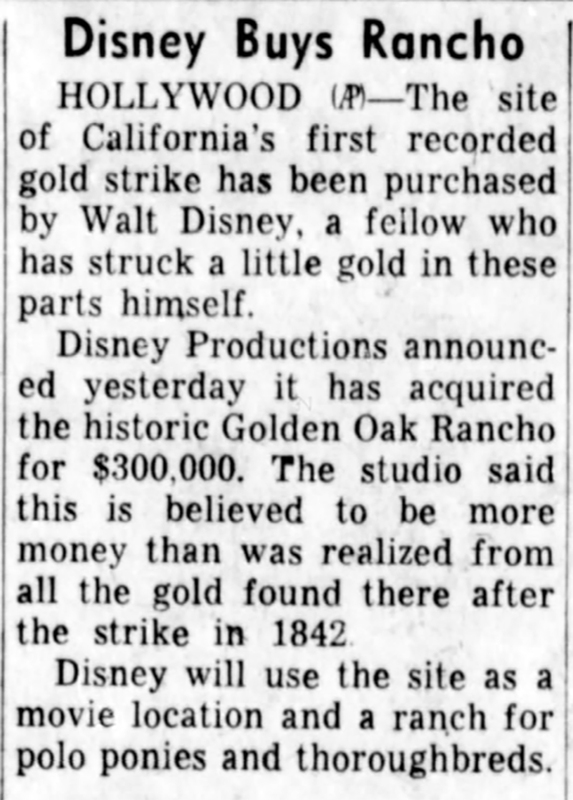 Disney Productions announced yesterday it has acquired the historic Golden Oak Rancho for $300,000. The studio said this is believed to be more money than was realized from all the gold found there after the strike in 1842. Disney will use the site as a movie location and a ranch for polo ponies and thoroughbreds. Commentary by Russ Leadabrand, Pasadena Independent | April 15, 1959. 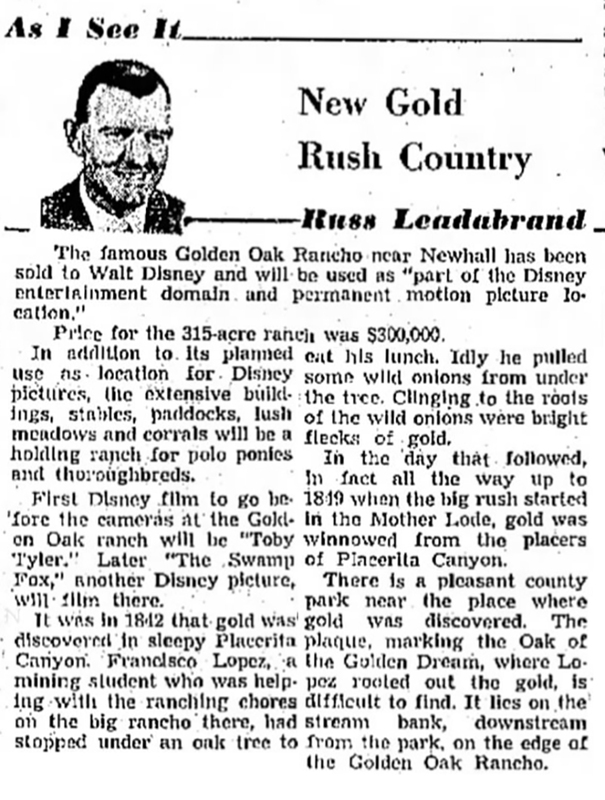 The famous Golden Oak Rancho near Ncwhall has been sold to Walt Disney and will be used us "part of the Disney entertainment domain and permanent motion picture location." Price for the 315-acre ranch was $300,000. In addition to its planned use as a location for Disney pictures, the extensive buildings, stables, paddocks, lush meadows and corrals will be a holding ranch for polo ponies and thoroughbreds. First Disney film to go before the cameras at the Golden Oak ranch will be "Toby Tyler." Later "The Swamp Fox," another Disney picture, will film there. It was in 1842 that gold was discovered in sleepy Placerita Canyon. Francisco Lopez, a mining student who was helping with the ranching chores on the big rancho there, had stopped under an oak tree to eat his lunch. Idly he pulled some wild onions from under the tree. Clinging to the roots of the wild onions were bright flecks of gold. In the day that followed, in fact all the way up to 1849 when the first big rush started in the Mother Lode, gold was winnowed from the placers of Placerita Canyon. There is a pleasant county park near the place where gold was discovered. The plaque, marking the Oak of the Golden Dream, where Lopez rooted out the gold, is difficult to find. It lies on the stream bank, downstream from the park, on the edge of the Golden Oak Rancho. Los Angeles Times | May 10, 1959. Strong sales activity throughout 1959 in real estate — industrial, residential and commercial, was predicted yesterday by Charles Detoy, partner, Coldwell, Banker & Co. The prediction was based on spiraling sales that were still mounting after the first quarter’s activity had been evaluated. Totals for the first three months by this company was $7,819,062. Commercial sales totaled $3,662,010. A major transaction was sale of the Signal Oil Co. building at 3160 W 6th St. to the Rubenstein Construction Co. of Phoenix, Detoy disclosed. The real estate firm also negotiated purchase of Golden Oak Ranch in Placerita Canyon by Walt Disney Productions. This 315-acre site was the scene of California's first gold strike. Lloyd Earl sold the property for $315,000. Detoy said the firm's sales of residential properties amounted to $1,795,500.